Black Swan And Wormhole Wizzards is The Satch's first studio album since slaying the classic rock world as a part of the supergroup Chickenfoot. Coping with the tragic loss of his mother Katherine at the time of recording, the master guitarist explores some of the more intensely emotional and meditative music of his career. The song titles say it all: "Solitude," "God Is Crying," "Wind in the Trees." It's still hard rock that, uh, rocks hard. 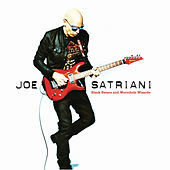 But this time around Satriani's love for the playful and surreal has been tempered. He even goes uncut blues on the slow-cooking "Littleworth Lane."